Great apps are even better when they’re on sale! We’ve selected 81 iPhone and iPad apps that are at least 25% off. 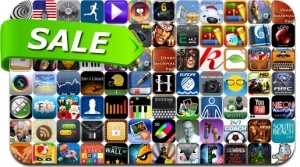 This app deal alert includes Samurai II: Vengeance, Fingle, Real Racing 2, Pickpawcket, 100 Rogues, ARC Squadron, Fluke, Zombies: The Last Stand, Rock Rivals, Tab Pro and many others. Free Audiobooks Pro- 4,727 audiobooks to go.